JOB LOT OF CALCULATORS. Condition is Used. Dispatched with Royal Mail 2nd Class. SCIENTIFIC CALCULATOR ELECTRONIC. TRADE JOB LOT OF 20 X. 3 x calculators .... 1 Sharp EL-530V scientific Calculator, 1 Rockwell automatic percent calculator 1 Casino SL-300. All Good Working Order. Condition is Used. 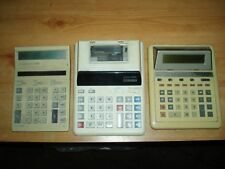 I have here 3 x retro desk calculators. They all work, even the print function on the Casio, but are in used condition from an office which had been going many years but closed down. Battery operated. ELSIMATE EL-231 WITH BOX. DECIMO ACCESS. SHARP GRAPHIC DISPLAY EL-9200 WITH BOX AND MANUAL. SHARP SCIENTIFIC D.A.L EL-531GH NO BOX. THEY ARE TESTED AND THEY WORK. Goods are sold to be collected in UK. Boots 646 Tested and working. These calculators are as follows Casio HL-820V Tested and working. Job lot 10 Sentry Contractor Calculator with Cover, Black/Yellow (CA600). Condition is New. Dispatched with Royal Mail 2nd Class. No ECHEQUES ETC I WILL NOT ACCEPT. Job Lot of 10. Square root function. Solar powered battery. From Vaping products including e Juice, Also Hardware, Ironmongery, Consumables, electrical, Clothing, Safety, and much more! Auto power off. Ideal for educational use. 5 basic used calculators, good clean condition. All are full working and tested. Wholesale Joblot. 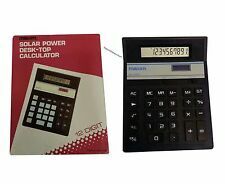 SOLAR POWER DESK TOP CALCULATOR. Job Lot x 4. Square root function. Solar powered battery. Auto power off (12 Minutes). From Vaping products including e Juice, Also Hardware, Ironmongery, Consumables, electrical, Clothing, Safety, and much more! 10 x Solar Mini Credit Card Pocket Calculator. Solar Powered. 10 x Solar Power Calculator. his basic calculator is compact, convenient and easy to carry. Pocket size no larger then a Credit Card. only 1 lot available! Here we have a bundle of electronic devices. Here we have a job lot of calculators. If an item is listed as collection only, we generally require it to be picked up in person. we are here to help. Job lot of Commodore & CBM vintage calculators. Joblot Calculators Casio And Md2 Solid State. Condition is For parts or not working.The first casio is working just fine.Last two untested as i have no batteries or any interest. Wholesale Joblot 100 x Texet 8 Digit Handheld Pocket Calculator Battery Powered. Handheld battery powered. Pocket size. Sold as Battery Powered as a few don't work on solar power. Requires 1 x AA battery ( Not Included). 3 Casio & 1 translator: spares & repairs. Others (3) do not work: spares or repair. 1xHL-700BK-A Works and is new in box. As does one other. Large Desktop Dual Power Multi Purpose Calculator. 8 Digit Dual Power Calculator. Auto Power Off. US Gallon & Litres. Imperial Gallons & Litres.